An anchor winch is an excellent tool for those that struggle to lift or adjust their anchor manually. Many Pontoon boat owners, and in particular those new to boating, can benefit significantly from an anchor windlass—designed specifically to assist in lowering and raising pontoon anchors. Anchor winches are now more commonly electric, aand designed to provide the utmost ease of use. However, as with many boating accessories, the possibility for breakage and faults is much higher in products that feature electric motors—especially if you choose a less reputable brand that doesn’t put quality at the forefront of its operation. For this reason, in the following article we will provide and analyze a variety of electric boat winch reviews, in the interest of helping you choose the best possible product available to you. 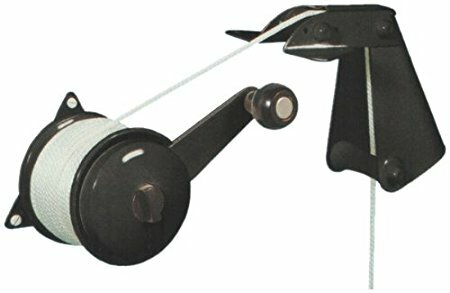 When buying an anchor winch for large and small boats, there is a list of criteria you should look to meet, in the interest of helping you purchase the product best suited to your needs. Before you begin your research you should, ideally, have compiled a list of your own personal requirements—as this will help you find a product that will genuinely assist you. The following points are generic guidelines, however, that will still prove helpful when searching. One of the biggest factors to consider when buying a Pontoon winch is whether the windlass will be able to accommodate the weight of your anchor. Ideally, you should strive to buy a winch that will lift and lower, as a minimum, the weight of your anchor– although if possible you should opt for one with a higher capacity. This will give you the freedom to use heavier anchors without concern. When buying the best electric boat anchor winch, you need to ensure that the installation mechanisms are both easy for you to use and, more relevantly, actually present in the kit that you’re purchasing. If you’re a new owner of a Pontoon boat, or not particularly experienced in tis department, then buying a winch that is easy to assemble and ready to install is highly recommended. It’s incredibly important that, when buying a Pontoon boat winch, you prioritize quality and durability. In the interest of choosing a product that will last you an adequate amount of time, and raise your anchor without any complications, you should certainly opt for a more durable product made from water resistant materials and sturdy metals. In the interest of facilitating the process of you choosing your windlass, we have selected a number of reputable products, and reviewed them comprehensively below. You can view these products as suggestions for you to consider, or as a means for comparison, and a good scale to measure your own favorite products against. There are, of course, many options for you to consider—and the reviews below will also assist you in evaluating their value, pinning the pros against the cons in the interest of helping you choose the most viable product for your needs. This electric anchor winch by Minn Kota is an excellent option for those looking to buy a simple, affordable windlass. This product is retailed with a two year guarantee, and features high quality materials, making it a worthwhile investment for you to consider. The Deckhand has a 40lb lifting capability, making it suitable for use with a variety of anchors, including those that are classified as slightly heavier than the average lake or sea anchor. This winch features an easy-to-install system, and is supplied with comprehensive installation instructions, making it an excellent option for Pontoon novices. Should your winch break after the two year guarantee ends, a number of customers have reported that finding and purchasing replacement parts for this product is a little difficult. This windlass by Trac-Outdoor is a basic, reliable option recommended for those looking for simplicity and functionality above all. It features an anti-reverse spooling system, a 35lb weight capacity and a number of other functions designed to provide you with ease of use. This product is easy to install, and a great option for those who don’t enjoy following complex instructions or for those who struggle with assembly. The Trac-Outdoor winch is particularly good at pulling anchors in harsher environments such as rivers, making it a highly versatile option for you to consider—especially if you intend to sail your Pontoon in different waters. A number of customers have reported that this particular, electric windlass is prone to rust and damage after regular use. This leads us to believe that some of the materials used in manufacturing aren’t as durable as you would hope for them to be. This manual winch by Anchormate features a simple, convenient crank system that can be used to raise and lower anchors as is needed. An interesting feature is that if users release the winch mid-crank, the anchor will remain suspended, which is a convenient function for those still learning various spooling techniques. The Anchormate windlass is a very versatile product. It’s easy to install, and can be mounted in a variety of locations on boats, making it an excellent choice of product for those interested in experimenting. How and where you install your Pontoon windlass will depend on the size of your boat, and other factors that are necessary in determining how to make most of your winch. For example, when installing your winch, you should establish whether you will be able to wire the electric motor to the battery on your boat with ease. This process is made easier if you’re replacing a preexisting electric windlass, as opposed to installing a new one, but regardless—you should make any necessary adjustments before you begin. You also should always follow instructions, and make sure that the guide supplied by the manufacturer is the main source of advice you use throughout the process. Winches are viewed, increasingly, as a basic necessity on many boats—particularly for those intending to sail for extended periods of time or in rougher waters. Motorized windlasses are also an excellent option for those looking to relax, without the concerns of pulling or adjusting their anchor for the entirety of the trip. Overall, a Pontoon winch is a great choice, and using the above guide, we hope you can find one best suited to your individual needs. It’s important to remember that your needs and the needs of your boat will vary greatly from those of others, meaning that your research should be individualized and targeted specifically to your circumstances. Above all, it’s critical that the winch you choose performs the task it was created to: maintains your anchor with little involvement on your part.